Somewhat strange for the company that normally releases games, but the kindly folks at Humble Bundle threw together a pack of video game-related / nerdy music for a great value. Who are the folks at Humble Bundle? Why are things usually related to video games? What are you talking about, Mat? Let me explain Humble Bundle. They're a group of generous people that receive permissions from independent artists and studios to release games in a limited-time-only, name-your-price sale. The profits from the sales go to three groups: the developers, a select charity or charities, and the folks at Humble Bundle, in order to help promote future bundles. However, not only does the sale allow you to name your own price, but it also allows you to choose where your own proceeds go. Pretty nifty, huh? This time around, they're going for a different approach. Instead of video games, they're offering up materials and albums from "the Internet's finest songsmiths," as they put it. Christopher Tin, Jonathan Coulton, MC Frontalot, They Might Be Giants, Hitoshi Sakimoto put their best feet forwards in this sale, offering some Greatest Hits collections for a relatively inexpensive price. However, and this is a very cool feature of the Humble Bundle crew, if you pay more than the average price, you get an extra prize! For this sale, it's a collection of remixed songs from indie pop stars OK Go, which should be the sweet musical cherry atop this delectable variety of flavors. I strongly recommend taking a look, for the sake of good music and charity. 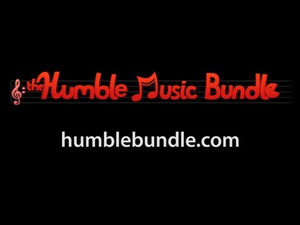 You can find the bundle on the Humble Bundle site.